Even though I’ve only done one thing on my list for the Small Projects Sew Along, it feels good to cross something off. The sewing machine cover is almost ready for binding. I just need to clean up these threads. Definitely not my favorite pastime, but it has got to get done. Here’s the pouch I finished up for my partner in the MSM swap. I used Amy Butler’s Stash and Dash bags pattern. I made a patchwork version by sewing together strips for the bottom panel, using the same fabrics I used for the sewing machine cover. While I was at it, I made a pouch using that same pattern to carry all my sewing do-hickies and thing-a-majigs. I used some Dr. Seuss scraps I had left over from a quilt I made for my daughter. Look who I put inside just for fun! Now, I’m off to finish cleaning up those threads. Hopefully, I’ll have a finished cover to share with you soon. love the pouches. Cant wait to see the machine cover. Show us the quilt for you daughter. Please! I'm sure its a cutie. YUM on those pouches!!!! I read your profile and smiled when I read "quilted love"! that is perfect! Cute blog! Such great pouches, Nicole. I really do love that orange/grey combo! 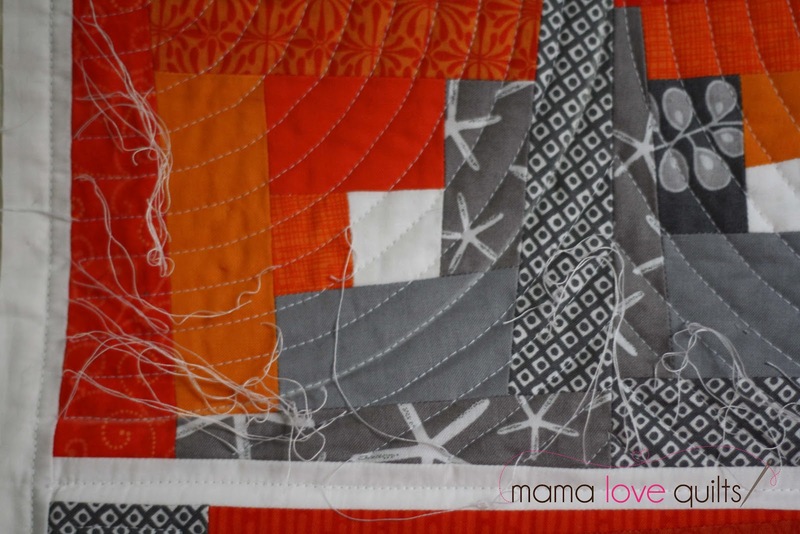 The orange/grey is really lovely – that is a lucky swap partner! Great progress – can't wait to see the completed cover. And nice little pouch(es) you made there! Sweet pattern. Loving the look of that cover, and your wee pouches!